In the 21st century, a significant change is underway in the food industry: farming is moving indoors. The perfect crop field could be inside a windowless building with controlled light, temperature, humidity, air quality and nutrition. It could be in the basement of a Tokyo high-rise, in an old warehouse in Illinois, or even in space. Just look at our collection of awesome indoor farms, where the sun never shines, the rainfall is irrelevant, and the climate is always perfect. 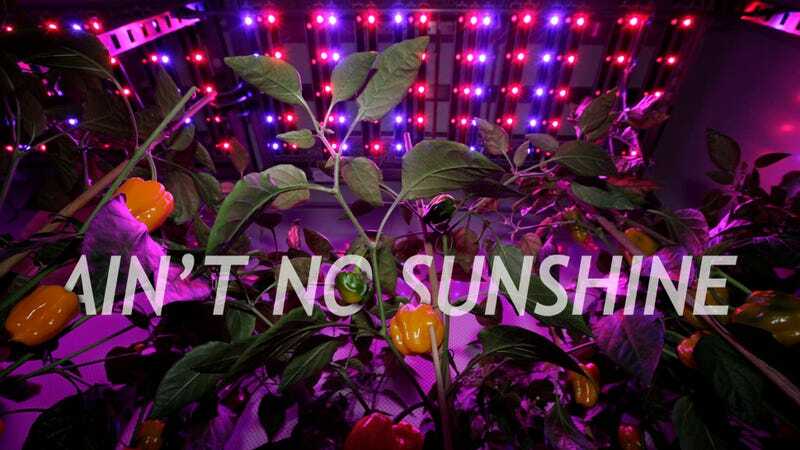 A worker checks crops at the FarmedHere indoor vertical farm, in Bedford Park, Illinois, on February 20, 2013. The farm, in an old warehouse, has crops that include basil, arugula and microgreens, sold at grocery stores in Chicago and its suburbs. Your endive grows in total darkness. Red endives at the California Vegetable Specialties indoor farm in Rio Vista, California (April 20, 2006). The growing process is long and fragile, with the endives' roots grown outside first and then moved in, where they are left for up to 11 months to grow into mature endives in total darkness. Toshihiro Sakuma checks the condition of plants under fluorescent lights at a greenhouse built inside a Tokyo building on July 1, 2005. This facility can be found in Oakland, California. The electricity bill is over $4,000/month. This indoor marijuana farm in California was raided by police. In the Netherlands it was legal to grow hemp for a long time. This is what cultivating the world’s finest indoor marijuana looked like a few years ago. Flowers grow under fluorescent lights in greehouse named "Pasona O2" in the basement of a highrise office building in Tokyo. The new style of greenhouse, built by the human resources service company Pasona Inc. in 2005 at the center of Tokyo's business district, is a facility to train aspiring farmers with high-tech methods involving hydroponics and light-emitting diodes (LED). Rice plants at an indoor paddy field in "Pasona O2". Pasona hopes this greenhouse can help promote the pleasure of agriculture to businessmen and businesswomen, and inspire a new generation of farmers. Tomatoes grown by hydroponics cultivation in "Pasona O2." A staff of "Pasona O2" checks vegetables grown under fluorescent lights. Hydroponics gardening for the masses. "The Volksgarden brings simple, clean, and amazingly effective hydroponics gardening to the comforts of your own home," says the company Urban Led Growth. This unit allows to grow up to 80 plants at once. Herbs, vegetables, fruits, and grains can be harvested easily and continuously thanks to the rotating cylinder housing. Put an AeroGarden into your kitchen. This dirt-free indoor garden planter uses aeroponics: vegetables, salad greens, herbs or flowers grow in this pod while being both slightly exposed to air and slightly submerged in the nutrient solution. The AeroGarden has built-in lights and a “Smart Garden” alert button to tell you when your plants need more nutrients or water. An automated, hydroponic, recirculating vertical farming unit. This is one of the four indoor, climate controlled, automated, hydroponic, recirculating vertical farming units at Green Farms A&M. Green Farms Agronomics & Mycology is located in Valparaiso, Indiana, and was founded in the fall of 2010. The first "Aeroponic Garden at Any Airport in the World." In 2011, the CDA and HMS Host Corporation collaborated to install a garden in the mezzanine level of the O'Hare Rotunda Building. In this garden, plants' roots are suspended in 26 towers that house over 1,100 planting spots. A nutrient solution is regularly cycled through the towers using pumps so that no water evaporates or is wasted, making the process self-sustaining. No fertilizers or chemicals are used. A view inside the "Astroculture" plant growth unit, during Space Shuttle mission STS-73, in 1995. Quantum Devices Inc., of Barneveld, Wisconsin, builds the light-emitting diodes used in medical devices and for growing plants, like potatoes, inside the plant growth unit developed for use on the Space Shuttle by the Wisconsin Center for Space Automation and Robotics (WCSAR). The astroculture facility has flown on eight Space Shuttle missions since, including this one in 1995 in which potatoes were grown in space. Expedition Five crewmember and flight engineer Peggy Whitson displays the progress of soybeans growing in the Advanced Astroculture (ADVASC) Experiment aboard the International Space Station (ISS), in 2002. The ADVASC experiment was one of the several new experiments and science facilities delivered to the ISS by Expedition Five aboard the Space Shuttle Orbiter Endeavor STS-111 mission. An agricultural seed company will grow soybeans using the ADVASC hardware, to determine whether soybean plants can produce seeds in a microgravity environment. Secondary objectives include determination of the chemical characteristics of the seed in space and any microgravity impact on the plant growth cycle.